Kekoa Pahinui already felt like an outcast, but it really hit home when his mom left him behind at Hilo International. She had a new online flame and least ways for now he’d have to live with his “biodad’s mom” until he graduated. Kekoa, who was a “half-black, half-Hawaiian kid” was little more than a “bully magnet,” but he’d show them. He was a talented drifter, not some kid who used daddy’s money to finance his car. Kekoa was his own man and worked on his own car, such as it was. Billy Cain, the daddy’s boy, and his cronies, Tucker and Ryan, decided to hold down Keiichi Yamada’s head and cut off his pink ponytail. Looked like Kekoa wasn’t the only one being bullied. Billy was a big man on the island, or so he thought. Adam Cain, his dad, owned half of it and could buy anything he wanted, including swatting away any trouble his kid could create. There would be plenty with Billy. Kekoa had yet to meet up with Billy and a feeling of elation passed through his body as he drifted on Tantalus Mountain. “Hu’ihu’i!” he shouted to no one in particular. All was maika’i with the world when Kekoa was drifting with his Nissan on those hairpin curves. He knew how to work them without using cheats like Billy did, something he’d find out in a matter of time. “Da kine, brah,” spouted out this skinny haole as Kekoa was getting into his car. Irritating, but this white kid named Sonny was the real thing. He didn’t even have a car, but the dirt under his nails meant he could work on them. That dirt meant there was going to be a team, a team that just might build that Nissan into a really great drifting car. Billy was buying his and fast “becoming the maestro of the mountain,” or so he thought. Kekoa was the one with talent and even when it looked bad he “was in control even of an out-of-control car.” There was going to be a race to prove just who was king of that mountain, but who was going to come out on top? Would talent rule over money? This is a dramatic, high-interest tale about drifting young readers will love. The characters in this story are very well-developed and the tale has just the right amount of tension to keep the reader turning those pages. Readers, especially reluctant ones, will love learning about the sport through the eyes of these Hawaiian teens. 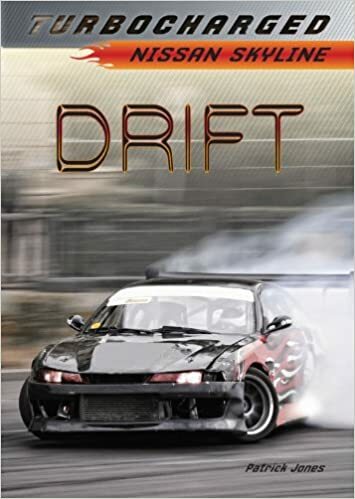 The rivalries, the action-packed scenes, the rich bully, the girl, and the sport of drifting pull this tale about the Nissan Skyline together quite nicely. The scenario, save for the racing, is one many teens can relate to. In the back of the book is more information on the Nissan Skyline, including one that discusses the part’s of Kekoa’s car.